I showed up to this restaurant with the fun-sounding name just after noon on a Monday and it had a pretty steady crowd. It took a while for my order to come out but I suspect that was due to the large party that just placed their order before me. Speaking of my order, I wound up with the Bun Bo Hue ($9.75 + $1 for poached egg). 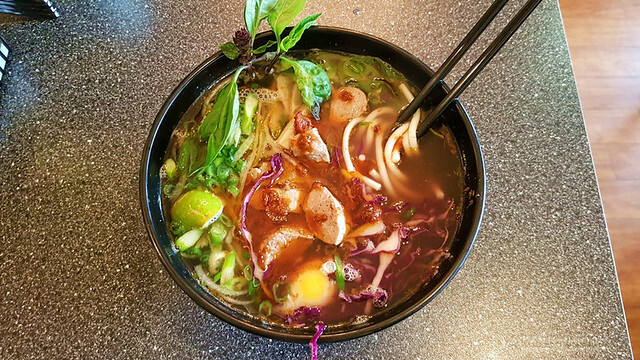 I like that their menu lists out the various additions that you can add to your pho to customize your bowl. 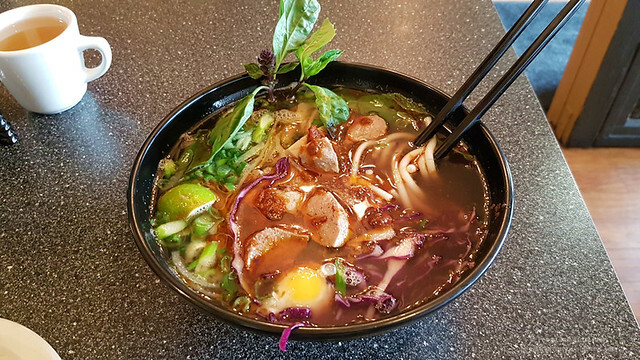 When my dish finally arrived, I was presented with a large bowl filled with round and slippery noodles mixed with thinly shaved beef brisket, beef balls, and Vietnamese ham. The beef broth was full of flavour and had a nice spiciness which helped to ward away the cold weather. I thought they did a pretty good job here with the addition of crunchy red cabbage so I decided to come back to try some of their other dishes. 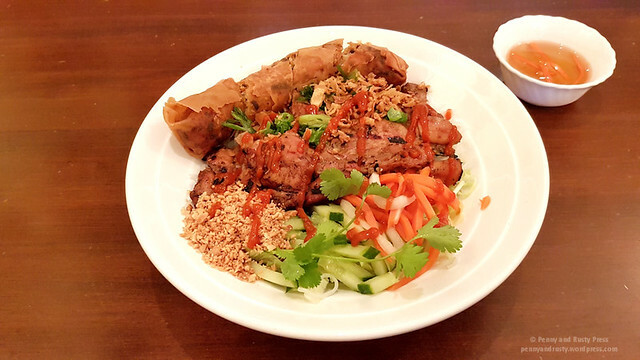 On my next visit, I ordered the Grilled Lemongrass Chicken and Spring Roll with Veggies and Vermicelli ($11.45). Just like my last visit, this restaurant was fairly packed during my visit but my food came out within 10-15 mins. The spring roll had a crisp flour wrapper (personally, I prefer rice wrappers) and the bowl was rather large. Overall, it was an okay dish but nothing that stood out. I came back for one last revisit to try their Com Ga Chien ($10.95) or Crispy Fried Chicken with House Special Sauce. 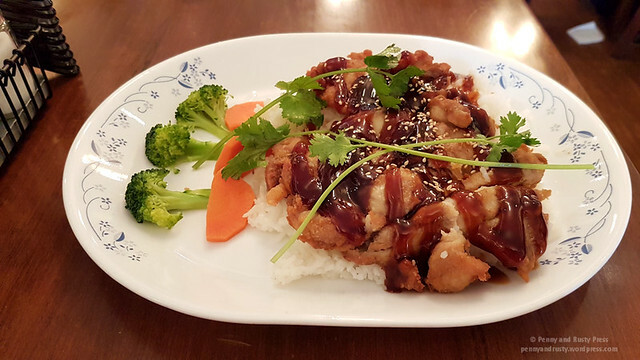 The boneless chicken cutlet was topped with a thick and teriyaki-style sauce that was a bit too sweet for my preferences. The thing that I did notice was the lack of napkins at the table. Might be a good idea to bring your own napkins if you plan to visit here. 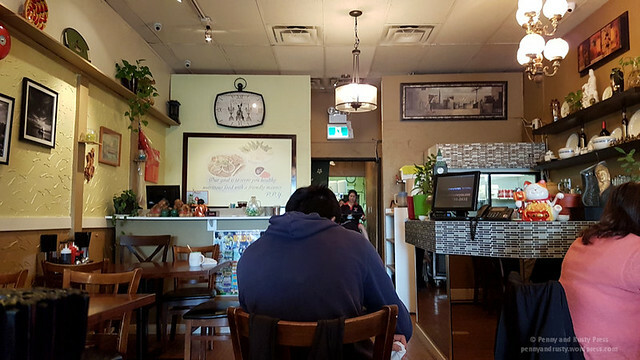 Posted on September 4, 2018, in Restaurant Review, Vietnamese and tagged Bun Bo Hue, Com Ga Chien, Grilled Lemongrass Chicken, New Westminster, Pho, restaurant review, Spring Roll, Vietnamese. Bookmark the permalink. Leave a comment.